I love the concept of beginning a new year. The idea of a clean slate appeals with its whiff of minty freshness. 2014 was full of struggles and difficulties and I’m glad to leave it in the dust. But out of the dust and dark, come things I’d never thought I’d be into. Like yoga. I don’t know if it’s really helping with my anxiety, but I do like to breathe and stretch and I’ve picked up a whole load of giggle-worthy Rodney Yee-isms. Hello, 2015, I’ll be pleased to meet you full on with adventures, possibilities and “soft eyes” (<< that’s my Rodney Yee-ism for you). This one-dish meal is a good recipe to keep in your repertoire. It’s simple and there’s not too much crazy prep and it tastes luxurious. 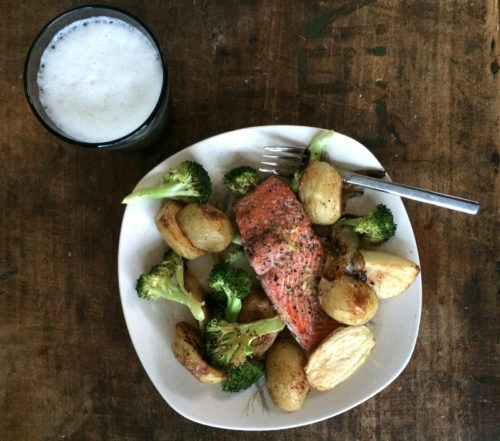 A simple way to keep up your spirits and have a delicious dinner on the table. 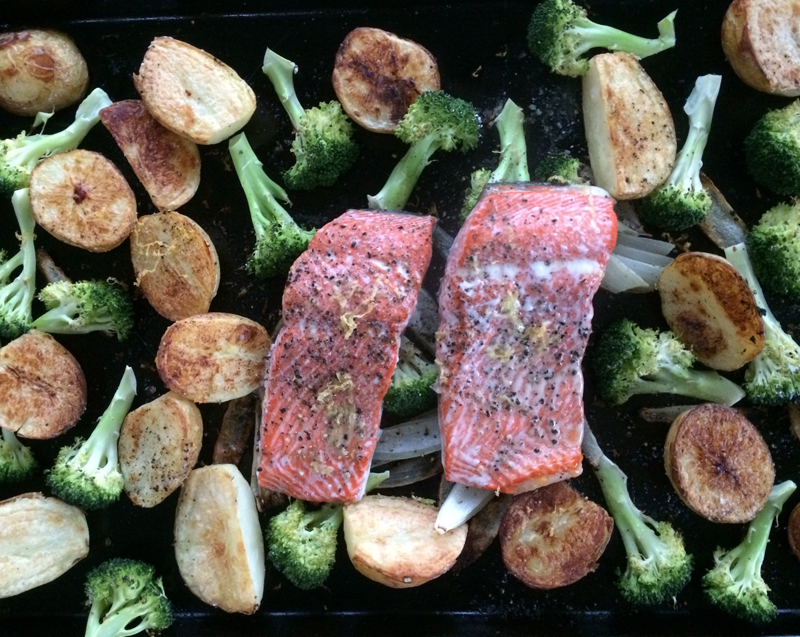 First you roast up some potatoes, then add some lemony-garlic broccoli and some salmon filets and back into the oven it goes. 10 minutes later, dinner is served. The broccoli is slightly tender with some crunch and the salmon is nice and moist. 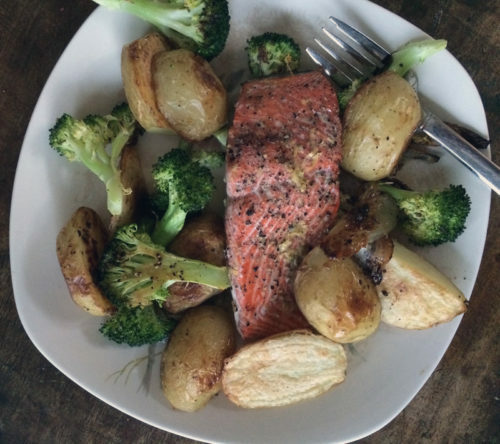 If you like a more charred or well-done broccoli, you can cook it along with the potatoes or roast them for 10 or 15 minutes before adding the salmon. It’s up to you. I should also mention that I have a winner for the Mark Bittman cookbook giveaway. The Random Number Generator selected number 32, so Kiva was notified over a week ago about the win. Congratulations! Thank you everyone who provided great tips and ideas and helping to make my first giveaway such a success. 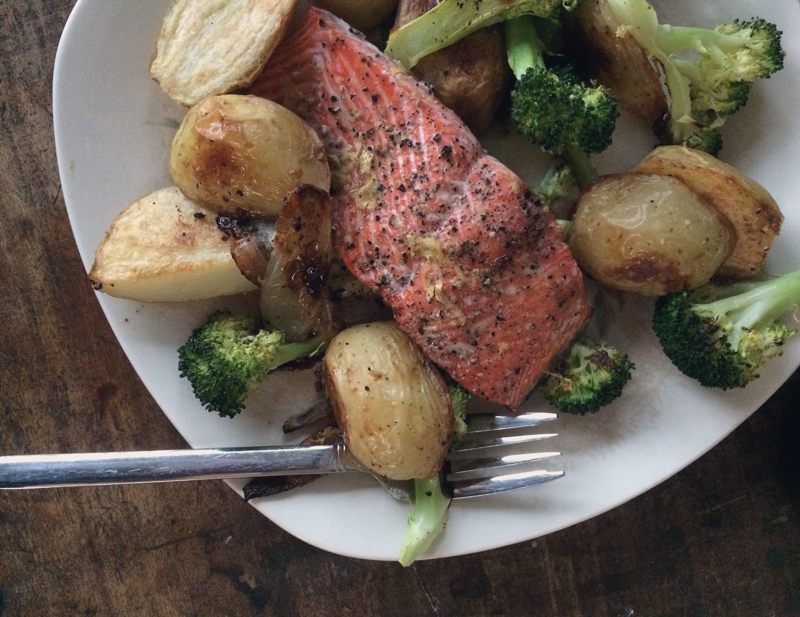 A quick and simple meal that impresses. Instead of using baby potatoes, you can just cut up a large russet or two into several wedges. Cut potatoes in half and add them to a rimmed baking sheet. Drizzle with olive oil, salt and pepper and use your hands to toss the potatoes until coated. Make adjustments so that all potatoes sit cut side down onto the tray. Bake for 15 minutes, flip the potatoes over and bake for another 10 minutes. Meanwhile, mix the lemon juice, zest and a little salt and pepper into a medium sized mixing bowl. Add in broccoli florets and toss. Remove potatoes from the oven and add the broccoli evenly about the potatoes, reserving all the liquid in the bottom of the bowl. Add the filets into the bowl with the lemon juice mixture flesh side down – you want to catch all the garlic, pepper and zesty bits. Place the 2 filets on top of the potato and broccoli and roast for 10 more minutes until the fish is cooked through. Plate and serve. Makes 2 servings. « singapore-style noodles with chicken, peppers & basil….and a Mark Bittman cookbook giveaway!! Happy new year! One of my new year’s resolutions is to eat a bit more healthy. This recipe is a step in the right direction, it looks and sounds delicious! This was scrumptuous! I cut the potatoes thin as we like them crispy. So quick and easy, will definitely add to our favorites, thanks! Tiffany, I hope you enjoy this tasty start to your New Years!! I received the cookbook on Tuesday! It’s HUGE and has so many delicious looking recipes I’m so excited to try out. Thanks again! Wow, Kiva, that was quick!! Enjoy it! Tried this today and it was a big hit with the family. We roasted some asparagus with it too, which worked well. Sounds delicious, Ray! Glad you enjoyed it. I love this combination of foods! Totally gluten-free and super healthy. So glad to hear that yoga is working for you. I cancelled my gym membership this week and I’m going to return to swimming again. I find it so much more calming, than spending an hour on the treadmill. What are Rodney Yee-isms…do tell. Here’s wishing you a super-duper year of fun adventures, great food and no more anxiety! Joanne, you’ll have to get a Rodney Yee dvd from the library to find out 🙂 He’s actually pretty great, but I always giggle when he says things like “soft eyes”. Swimming is something I’d like to try more of. Have a great year! !